What a Purim it was! A complete turnaround for me from years past. To be honest, until yesterday I never really looked forward to Purim. I dreaded dressing up. And until we made Aliya, we didn’t feel so “at home” in our community, so there wasn’t an abundance of Purim festivities for us to join. All that changed now that we made Aliya and live in Modi’in. We feel so at home here, and have such a strong community and group of friends. When Purim talk started a month ago, instead of cringing I was actually excited to jump right in! I wasn’t struck with a costume idea right away, and though I searched Pinterest for hours I didn’t find anything that inspired me. I knew I wanted to come up with a costume first and craft Mishloach Manot to match. 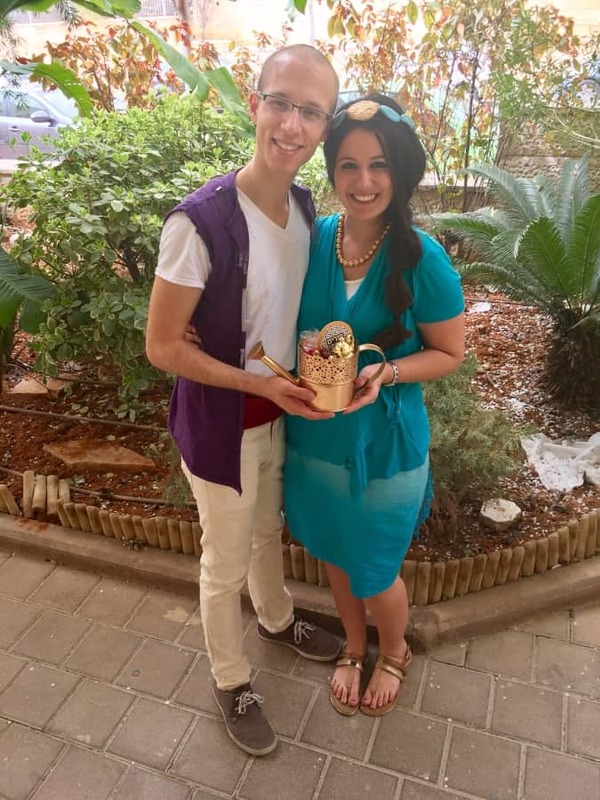 Then, in shul two weeks ago we were discussing the upcoming holiday, and my friends gave me the idea to go as Jasmine! After trying it out, I thought I could mimic her look and famous hairstyle! And the hubby would be Aladdin, of course. So that was that. Except…it wasn’t. Without Amazon to turn to, I wasn’t sure how to go about finding a suitable costume without breaking the bank. Next came my Mishloach Manot plans. 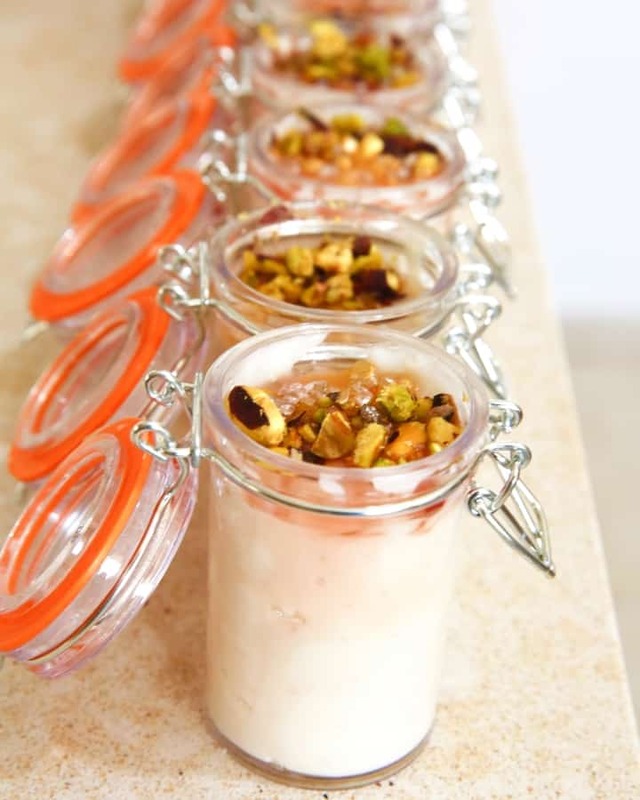 I immediately knew I wanted to make Arabian (middle eastern) desserts to go along with the theme. I Googled “middle eastern desserts” and the most popular dessert was, of course, baklava. But after another quick Google search, I saw that Busy in Brooklyn had already turned those into hamantashen, so I found another one I was excited to try: Basbousa! It’s a classic semolina cake, native to Egypt. I did a test run and was impressed with the results. It had such a different taste than anything I am used to (I come from a very Ashkenazi family) and it turned into a beautiful hamantasch! Definitely check out the recipe below! 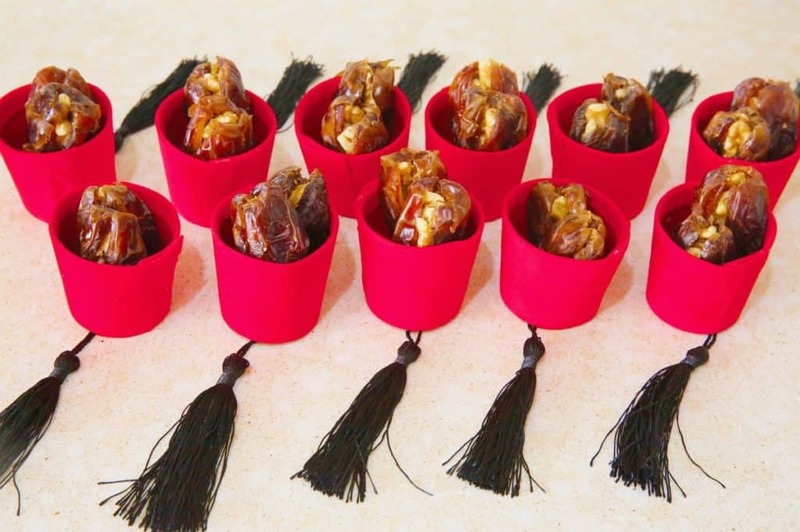 I also included walnut-stuffed dates in mini-Aladdin hats, store-bought halva in the most adorable genie lamp candy bags, and homemade malabi using my sachlav recipe and then just refrigerating it. 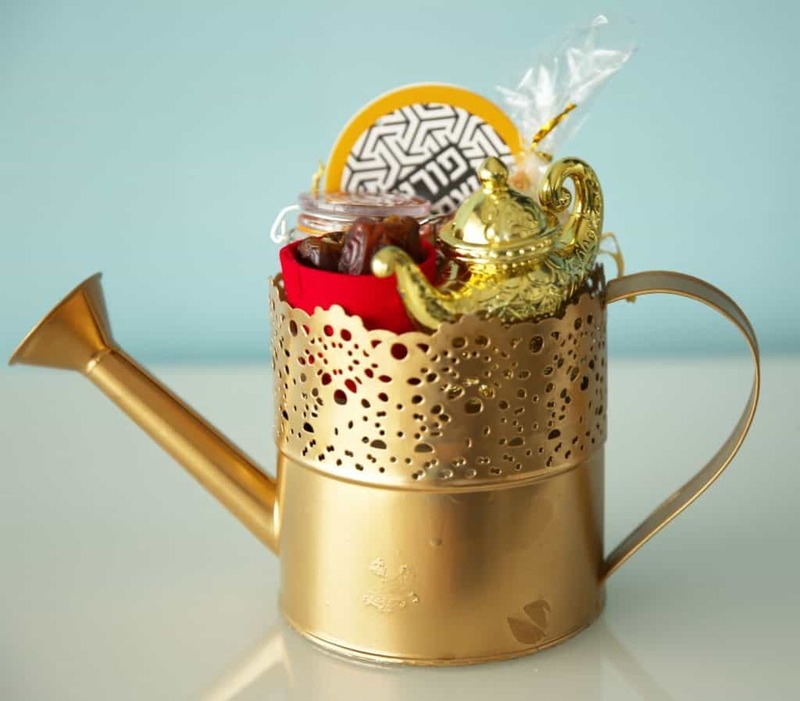 For presentation, my dream was to deliver everything in a genie lamp! Of course, without Amazon I wasn’t sure how to find exactly that. So I looked around at our local stores, and the closest I could find was a white watering can. I decided to buy it and spray-paint it gold. I figured everyone would get the idea! Overall, I’m really happy with how my first real Purim (in a while) turned out, and can’t wait for next year— a shocking statement coming from me! 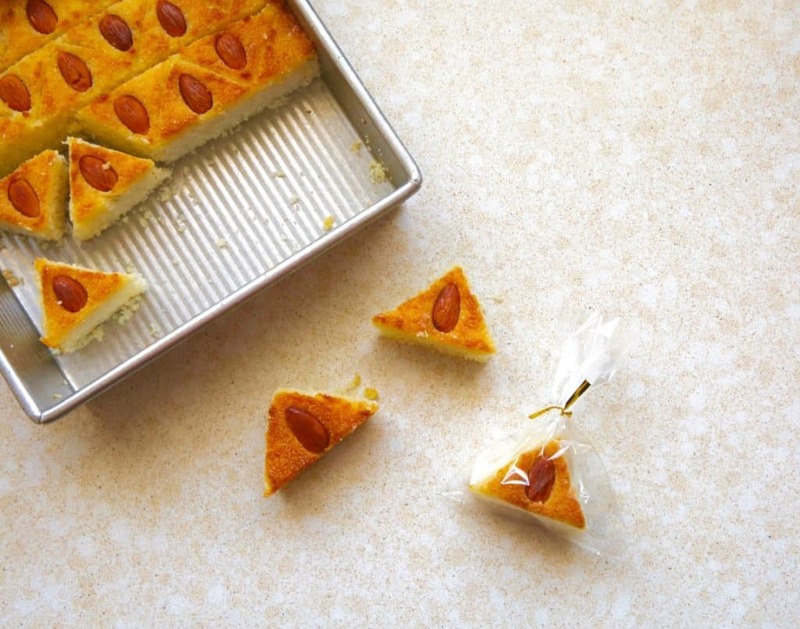 Basbousa is a native Egyptian and traditional Middle Eastern sweet cake made from semolina flour. It usually is dairy, has coconut and topped with a deliciously sweet syrup containing orange flower water or rose water. I made this version parve but feel free to substitute the soy sour cream, fake butter nad coconut milk for the real stuff! In a large mixing bowl, mix together the flour, sugar, coconut and baking powder. Add in the sour cream, melted butter, coconut milk and vanilla extract and mix to incorporate. The batter should be very thick and not liquidy at all. Pour the batter into a greased baking dish around 9x9, you don’t want it to be more then 1 inch thick. Using a knife cut a design into the top of the cake, it will hold as the batter is thick (see image for reference). If you're making it for Purim, cut lines for triangles that you will later cut out into hamantaschen. If making in general then cut any design you would like, diamond is most common but squares/rectangles work too. Press an almond, or any of your favorite nuts into each square, diamond, triangle. While the cake is baking, make your syrup. In a small sauce pan, add in all the ingredients and heat over medium flame until the sugar is dissolved and the syrup is thick and clear. When the cake is done, turn your broiler on and broil for 2-4 minutes until golden, make sure not to burn it! Remove the cake from oven and pour the syrup to cover the whole top. Cover the cake and let it cool, allowing the syrup to be absorbed. Using the lines you created, cut out pieces, and enjoy! It was not only an extremely clever presentation (I’ve kept the red mini “tarbush” that held the stuffed dates) but it was all delicious too! Continued success with all your ideas! A very clever presentation – and delicious!